Over a thousand years ago, bold Pacific voyagers traversed a massive blue expanse, teeming with life. The natural abundance of the ancient world is unimaginable to those of us living today, as our seas have been emptied of the great whales, turtles, sharks, and other large fish. Using their knowledge of their surroundings, from the direction, time of day, and species of birds they saw flying in the sky, to the location of stars just above the horizon, they sailed across a vast ocean and populated the scattering of islands across the Pacific. They sailed north to Hawaii, south to New Zealand and East to the edge of Polynesia: Rapa Nui. 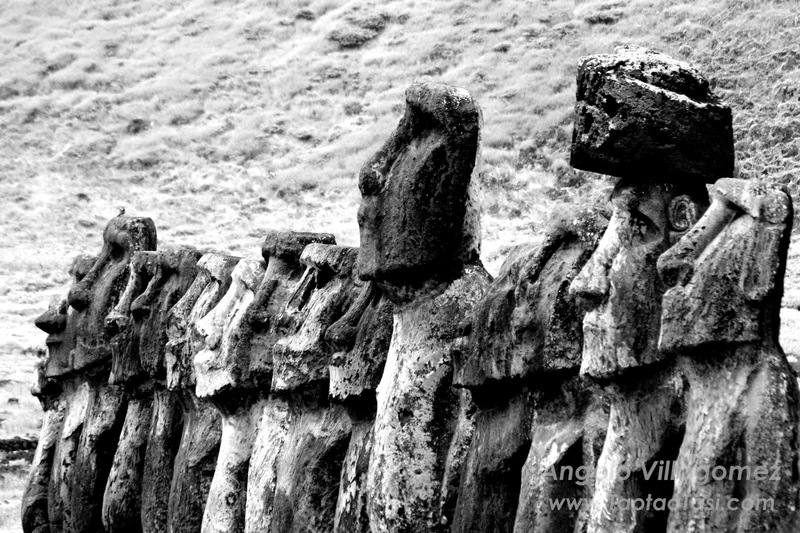 Known as Easter Island to the western world, Rapa Nui – for which the decedents of these voyagers and their language are also named – is 4,000 kilometers west of mainland Chile. When these voyagers arrived on Rapa Nui, they found an uninhabited island that could sustain and nurture future generations. And there they have lived for centuries. Today, the Rapa Nui completed a different journey. After five years of work, they succeeded in protecting their ancestral waters. On Saturday, Chilean President Michele Bachelet announced that her government would act on the results of a referendum held on the island, in which the islanders voted in support of the creation of a Rapa Nui Rahui Marine Protected Area (MPA). The Rahui – named for a traditional practice of protecting an area or region – safeguards the entire exclusive economic zone (EEZ), over 740,000 square kilometers, from industrial commercial fishing, mining and other extractive activities. It also grandfathers in the artisanal fishing practices of the Rapa Nui – fishing from small open boats using hand lines and rocks as weights. Having seen, first hand, the devastating impacts of overfishing, marine pollution, and warming oceans in the many corners of the world, I could understand the plight the Rapa Nui faced. Their fishermen have seen factory ships on their horizon while themselves catching smaller and fewer fish. This is why, in 2012, the Bertarelli Foundation and the Pew Charitable Trusts supported them on their journey to reverse this trend and protect their seas. 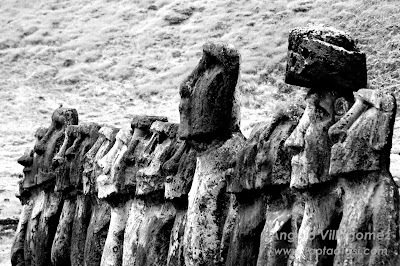 Even with the fame provided by the Moai carvings – centuries old giant statues that are the centerpiece for Easter Island’s UNESCO World Heritage Site – much of the past of the Rapa Nui remains a mystery. An undeniable aspect however, is a deep connection to the oceans. Forged from their roots as Pacific voyagers, the Rapa Nui maintain cultural expressions of the ocean through art, song and dance. It is this intrinsic link the Rapa Nui have to the sea that drove an extensive public consultation. More than 100 community meetings took place to discuss ideas for marine protection. They culminated in a proposal for a marine protected area put forward in 2015 by the Te Mau o Te Vaikava o Rapa Nui (Mesa del Mar) -- a coalition of more than 20 local organizations and local leaders. The coalition also developed an environmental curriculum for the island’s schools and conducted direct household outreach, across the entire island, to strengthen support. Cultural and ecological degradation are often connected. Fortunately, the reverse is also true and the MPA is indicative of the Rapa Nui’s understanding that conserving their marine environment is a step towards preserving their traditions and way of life. The journey toward the Rapa Nui Rahui is representative of a cultural renaissance across the Pacific Ocean that occurred along with the growing awareness of the importance of protecting the ocean, particularly in creating large marine protected areas. The Pew Bertarelli Ocean Legacy Project filled a supportive niche for the Rapa Nui. It enabled the completion of the most comprehensive scientific assessment of the island’s marine environment and an economic analysis on impacts of an MPA. We were able to provide environmental education and training, facilitating cultural exchanges with other Pacific islanders, and offer first-of-its-kind satellite monitoring assistance for illegal fishing. The Rapa Nui Rahui Marine Protected Area protects the needs of the indigenous community and the thriving marine ecosystems of Easter Island, which are home to at least 142 endemic species, 27 of which are threatened with extinction. The Rapa Nui have written a new chapter in their history based upon their cultural values of guardianship, responsibility and accountability for the natural environment. The Rapa Nui Rahui sends a message to the world: large marine protected areas can provide both conservation benefits – safeguarding ocean health, rebuilding species abundance and diversity and providing strengthened resilience to the impacts of climate change – and preserve cultural and traditional practices of coastal and island communities. This historical moment sets an example for all the indigenous communities around the world that wish to protect their ancestral way of living and protect their legacy. Dona Bertarelli is the co-president of the Bertarelli Foundation, a philanthropic organization established to implement real change in marine conservation and life science research. In April 2017, President Donald Trump ordered Secretary of Interior Ryan Zinke to examine 27 protected areas established by Presidents Bill Clinton, George W. Bush, and Barack Obama using the 1906 Antiquities Act. Included in the list were four marine monuments in the Pacific Ocean, the Papahanaumokuakea Marine National Monument in Hawaii, Mariana Trench Marine National Monument in the Mariana Islands, Rose Atoll Marine National Monument in American Samoa, and the Pacific Remote Islands Marine National Monument (sometimes referred to as Pacific Remote Island Areas or PRIA), which is made up several isolated islands and atolls under American control. This should have all of us on Guam and in the Pacific concerned, because we are the people who will have to live with the outcome. During a two month public comment period, 2.7 million Americans submitted testimony. An analysis of a random sampling of the comments found that 99% were in support of maintaining protections for the marine monuments. Secretary Zinke submitted his draft report to the White House in August, which was leaked to the Washington Post in September. The report contains recommendations to shrink four monuments and to open a dozen others to commercial extraction including Rose Atoll and Pacific Remote Islands. There is no word from the White House on when the final report will be released to the public, or when and if the President will act on Zinke’s recommendations. There is additional concern that the entire marine monument review has everything to do with opening up protected American waters to fishing so that they can be sold off to foreign businesses. Recently approved Fisheries Management Plans (FMP) for the Northern Mariana Islands, Guam, and the Pacific Remote Islands were published in the Federal Register in August 2017. The FMPs would allow the federal government to enter into agreements to sell access to American waters to foreign fishing vessels. The Federal Register notices for Northern Mariana Islands and Guam read, “Section 204(e) of the Magnuson-Stevens Fishery Conservation and Management Act (Magnuson-Stevens Act) authorizes the Secretary of State, with the concurrence of the Secretary of Commerce (Secretary), and in consultation with the Council, to negotiate and enter into a Pacific Insular Area fishery agreement (PIAFA). A PIAFA would allow foreign fishing within the U.S. Exclusive Economic Zone (EEZ) adjacent to American Samoa, Guam, or the Northern Mariana Islands.” The Federal Register for the Pacific Remote Islands extends the possible fishing areas to Baker Island, Howland Island, Jarvis Island, Johnston Atoll, Kingman Reef, Midway Island, Wake Island, and Palmyra Atoll. There is a long history of conflict between industrial commercial fisheries and local fishermen in the American Pacific. The 50 nm zone around the Northwest Hawaiian Islands and the main Hawaiian Islands and Guam were closed to longline fishing in 1991 and 1992, respectively, because of the destructive nature of longline fishing and the effect this was having on the catches of local fishermen. Fisheries managers have known for 25 years that longline fishing damages fragile ecosystems. Opening up these protected areas to industrial fishing would set conservation efforts back nearly three decades. As another example, the 50 nm zone around American Samoa was closed to longline fishing in 2002. This decision was made for similar reasons to the previous closures in Hawaii and Guam, to allow space for the traditional fleet of “alia” vessels to fish without competition from the much larger industrial scale vessels. In 2016, at the recommendation of the controversial Western Pacific Regional Fisheries Management Council (WESPAC), the federal government reduced the exclusion zone to 12 miles. American Samoa sued the federal government saying the move violated their customary practices – and won. By the way, it is worth pointing out the WESPAC is also the driving force behind the effort to open the marine monuments. The majority of the American citizens living in the U.S. Pacific territories do not want to compete with industrial fishing that mostly export fish overseas, they want to see fish remaining in their waters for their benefit and use. The move to open the marine monuments to commercial fishing and the drive to sell American waters to foreign businesses is something that will benefit a few people to the detriment of everyone else. Carlotta Leon Guerrero is a former Member of the 23rd, 24th, and 25th Guam Senate. She was also a two-term president of the Association of Pacific Island Legislatures and previously worked as a radio and television journalist in Guam and the Northern Mariana Islands. They're planning on culling this down to about 20-30 photos, and then putting together the information that will accompany each photo. They're also looking for places and events to display the exhibit, particularly on Saipan, Tinian, Rota, and Guam. Got any good ideas? Leave them on the Facebook page or in the comments of this blog. Saipan, Northern Mariana Islands, September 25, 2017 – As islanders, we are very appreciative of the ocean. We enjoy seafood, boating, swimming and all the other benefits our oceans provide. But how many of us really know about marine protected areas around the CNMI? 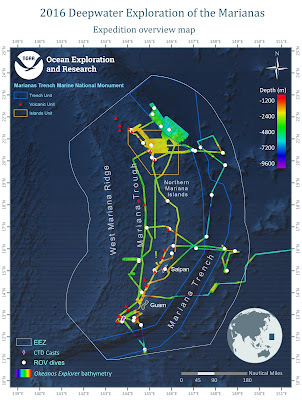 Or about our very own Mariana Trench Monument, a marine protected area that is internationally recognized? Well a scientist from England, Danny Morris, also wanted to learn about our oceans, and he spent this past July and August on Saipan gathering data on this topic. Danny is working towards his master’s degree at the University of York in England under the guidance Dr. Callum Roberts and Dr. Julie Hawkins, leading researchers in the field of ocean sciences. These scientists study the ocean and marine life all over the world. Dr. Roberts is an expert on coral reef biology and he also studies the relationship between humans and marine ecosystems. While Dr. Hawkins researches the environmental benefits of marine protected areas. Since the Mariana Trench Monument here in the CNMI is one of the world’s most unique marine protected areas, having animals that are not found anywhere else, Danny wanted to learn how we felt about ocean protection. According to Danny, the Mariana Trench Marine Monument is very special and it was the CNMI’s conservation ethic that drew him to Saipan to conduct his research. While Danny was on Saipan, he interviewed over 200 U.S. citizens to gain a better understanding of their view of marine protected areas around the Northern Mariana Islands. He spoke mainly to Chamorros, Carolinians, Filipinos, and other Micronesian ethnicities. People who were not citizens were not allowed to be surveyed. He spent time in public places speaking to passersby, maybe you were able to speak with him and be interviewed for his scientific survey? He asked general questions about ocean protection, and more specific questions on marine protected areas and the Mariana Trench Marine Monument. Danny’s work on the island is significant as ocean protection is important for maintaining our community and safeguarding our cultural legacy. According to scientists, at least 30 percent of the world’s ocean must be protected. While the Mariana Trench Monument seems to be a large protected area it is actually less than 5 percent of US waters. Scientists say that marine protected areas like the monument provides sanctuary to many marine animals so they can reproduce and move to other areas. They also say that marine protected areas are important to safeguard fragile animals like corals, and to protect species that are found nowhere else. Many were pleased that Danny was able to conduct research here. Ignacio V. Cabrera, Chairman of the Friends of the Monument (FOM) said that he was happy to hear from Danny. “It made me smile to know that these young scientists are taking an interest in what we have here,” Ike added. When not conducting his surveys, Danny spent time with various families in the community. Auntie Chailang Palacios and Uncle Bob Power hosted Danny at their home for several weeks. “He’s a wonderful and polite young man,” said Chailang. “It was great fun for us to have him with us”, she added. While staying there, he was introduced to a variety of people including Agnes McPhetres, a co-founding chair of the FOM. Auntie Agnes was also delighted that Danny was here to study. Danny is now home in England finishing his thesis to complete his Masters of Science degree in Marine Environmental Management. We expect to learn more about the results of Danny’s study in the coming weeks.